Over the last several years I’ve become a fan of reading history. As I mentioned in Civilizational Collapse and the Brain, I’m currently working through the Hinges of History series (link to kindle edition) and after a short diversion plan to start into Victor Davis Hanson’s entire works. Because learning from history is critical to understanding the future. Enslave and convert this, assh*le. This video is bone-chilling. Assuming you have a survival instinct, that is. "One day millions of men will leave the southern hemisphere to go to the northern hemisphere. And they will not go there as friends. Because they will go there to conquer it with their sons. The wombs of our women will give the victory." 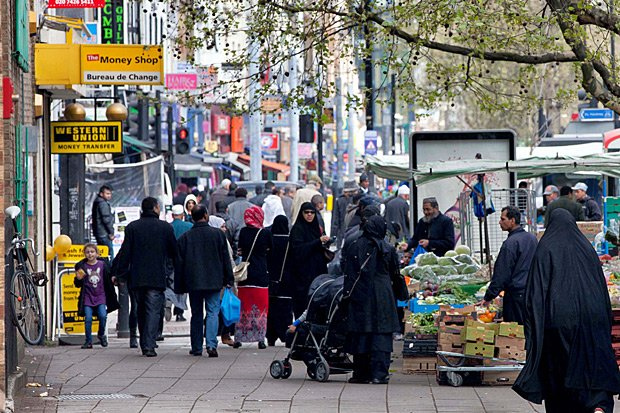 In the UK variations of Mohammed make it the most popular boy’s name for five years running; London itself is now over 50% immigrant. In the Netherlands, Mohammed tops the list for the second year in a row. It will be Germany’s most popular boy’s name soon. By 2080, assuming projections hold, Italians will be a minority in their own country. To quote a phrase: This will not end well. Q: Do you believe in the "Eurabia" theory, as do right-wing politicians in Italy? 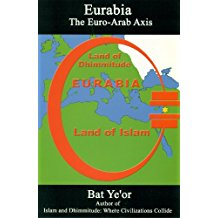 A: When Bat Ye'or first proposed this theory in 2002, I was skeptical, not believing in a purposeful conspiracy to replace Western civilization with Islam. Fifteen years later, and especially after witnessing the astonishing actions of Germany's Chancellor Angela Merkel, I find it convincing. 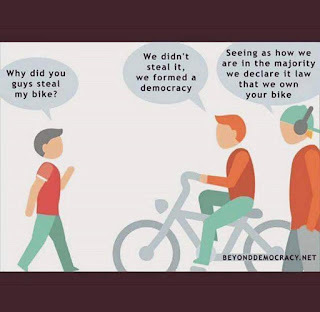 I can see no other way to explain the spectacular unwillingness to recognize the damage caused by unfettered immigration and blind multiculturalism. This is deliberate and preplanned civilizational treason of the highest order. The UK, for example, is warning and even arresting people for being critical of Islam (No wonder real crime is up: London alone has over 900 police officers “dedicated to investigating hate crime”); Germany and others are silencing anyone who speaks out. In the US Democrats fight to keep Muslims opposed to Jihad from speaking. A 71-year old Swedish man, critical of Islam on social media, was prosecuted. People lose their jobs for speaking out. 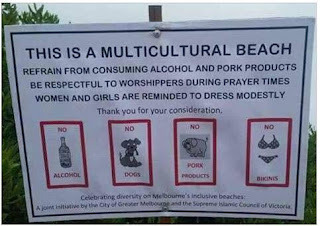 Sharia rules are proactively implemented to appease in multiple countries; we all know how appeasement works out. Unelected EU bureaucrats are filing suit to force countries to submit to the invasion, EU Sues Hungary, Poland, Czech Republic for Refusing to Take Migrants. They’ve developed apps to help migrants; hell, they’re flying them in to be sure they arrive safely, unlike the last invasion – stopped on September 11, 1683 (gee, doesn't that date sound familiar!) – where the invaders had to get to Europe on their own. 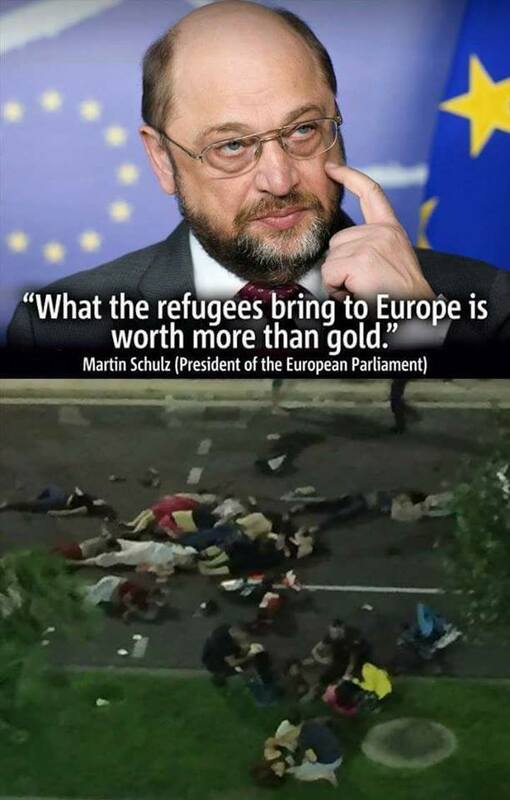 Germany’s Angela Merkel is not backing down from admitting the invaders by the metric f*ckton. Britain’s Tony Blair intentionally opened the gates. 1. 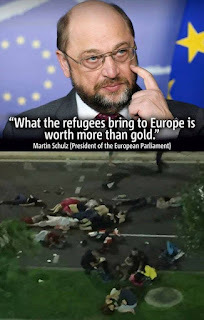 The flow of Islamic migrants must be stopped cold – a good start would be to eliminate the enormous (and economy-crushing) financial incentives to move, and the massive financial incentives to help them. 2. Barriers must be built: walls manned with armed guards and permission to shoot at those attempting to breach that wall. Turn back the boats and, if necessary, sink them; survivors forcibly returned to their origin country. 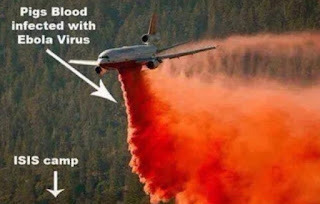 As a step after that, bomb the harbors from where the boats leave and airdrop pig blood and offal over the entire area. As a last resort, lethal measures against invaders in transit must be used – sharks, buzzards, and other scavengers have to eat too. 3. In parallel with these efforts social media must be pushed to show that the Hijra invasion is no longer welcome in Western countries. 4. Politicians that want this flow to continue must be removed from office; peacefully if possible, but it may be necessary to break eggs to make omelets. Similarly, Leftists who take the side of invaders, like these filth, may need the same “attitude adjustment”. Anyone who clings to the historically untrue and thoroughly immoral doctrine that violence never settles anything I would advise to conjure up the ghosts of Napoleon Bonaparte and the Duke of Wellington and let them debate it. The ghost of Hitler could referee and the jury might well be the Dodo, the Great Auk, and the Passenger Pigeon. Violence, naked force, has settled more issues in history than has any other factor, and the contrary opinion is wishful thinking at its worst. Breeds that forget this basic truth have always paid for it with their lives and their freedoms." Let me be painfully clear: I don’t want this path. I don’t want civil war, I don’t want violence in general, let alone – potentially – civil wars across entire continents. But our political elites, between their quest for votes and shame at their own civilization’s success, have pushed this upon us. Even if there is, somehow, a non-violent path it will not be easy. Their side will not give up the keys to power without a fight. 6. 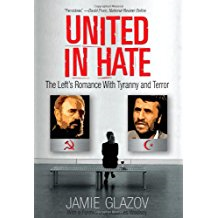 A Long March through our own culture to retake it back from those who would weaken it(part of that is understanding the Islamo-Leftist alliance; read this about the Left’s culture, and my own observations The Leftist Sense of Self). Religious faith, and the directive to “be fruitful and multiply” must be renewed. Martial practices and values will have to be reinstated. So, too, civics education and an understanding of how special Western Civilization truly is. Bring back the "dead white guys!" 7. A real education of the true nature of Islam, e.g., The Greatest Murder Machine in History and practices like “sacred deception” as mandated for Jihad, e.g., Taqiyya and Tawriya, must be fundamental in every person’s education. Again, this speaks to the Left's racism in not thinking that brown-skinned people could have the wit to deceive them. 8. The effete elites must be not just fought and countered, but shunted aside and shunned. 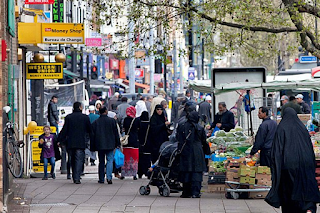 Make “multiculturalist”, among other terms, as much of a slur as “racist” (and get used to being called one – laugh it off, it pisses them off no end). Let’s honor and encourage large families; while raising families incorporate lessons from books like The Dangerous Book for Boys. Read up on Alinsky’s tactics and use them against them. 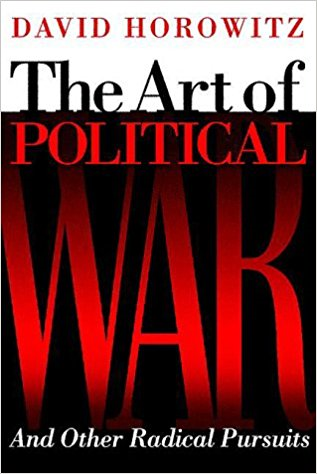 The Art of Political War and Other Radical Pursuits is a great starter book for this. 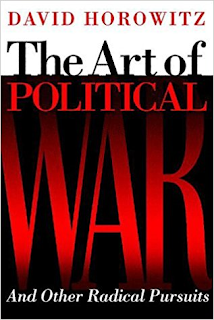 Also read the classic war manuals like Sun Tzu: The Art of War and Musashi’s Book of Five Rings. Even the novel Unintended Consequences has some great practical lessons on what can be done if (when?) the time comes. 9. Any prison sentence for an invader must include a forced shower of pig blood. No Halal foods in prison. If a serious crime worthy of death (and it will need to happen in Europe, not just America), execute and bury them in an unmarked grave with offal after funneling pig blood and urine into their corpse’s stomach (or, better, give their corpses the Hannibal boar treatment). 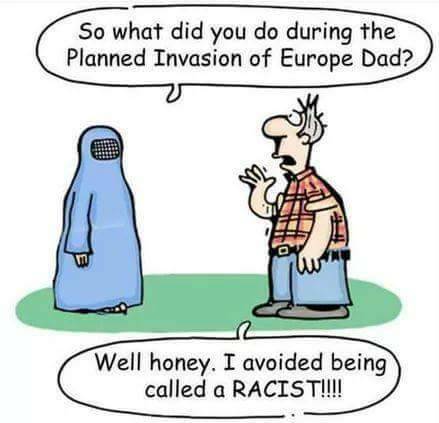 And that whole process needs to be broadcast to the invader home countries via social media. 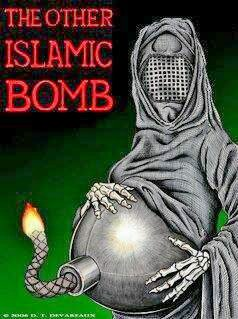 The lesson to them must be crystal clear: any invader will be denied Islamic paradise through contamination by pork. It worked for General Jack Pershing, it’ll work now. 10. The funding for Muslim states, particularly through energy, must be cut off. Whether through “Drill, baby, drill!”, nuclear, green energy as appropriate, etc., our dollars / euros must cease to flow to countries that support Hijra (let alone terror). 11. Their fundamentalist religion/politics/culture must be weakened (consider, for example, this Muslim who asks some excellent hard questions, or this one who points out the insanity of the Left vis a vis Islam) and conversion away from Islam encouraged. This is a daunting and doubtless multi-generational task, but with the help of non-Muslim Islamic scholars as well as giving aid to Christian missionary efforts (aided by those who we know have already converted out) to continue this trend. Don’t ignore those like this woman who has, from this video, outright rejected Islam. Also critical to this will be an understanding of tribes – central to most Muslim cultures – and leveraging that against them. Another critical thing to understand is their Shame Culture – that’s another weapon we have if we can learn to use it. Both the Left and the Islamists have a Long Game; we need one too. We’re playing for infinitely more than we can afford to lose. So let’s not lose. We are faced with a simple binary choice. Either Western Civilization falls to the invasion, or the invasion is repelled. There is no third choice - we cannot coexist intermingled with a culture that is not just hostile to us, but actively intent on conquering us. And it is an absolute certainty that the path we’re on leads to the end of the greatest civilization that has ever existed on earth. 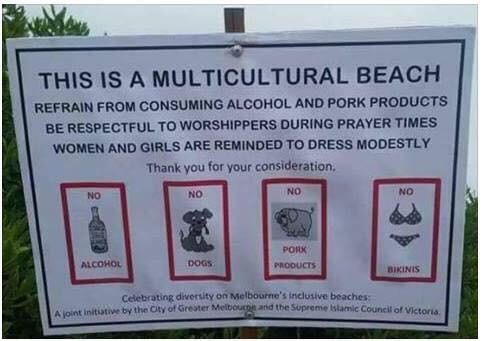 If we do nothing, Western Civilization falls. 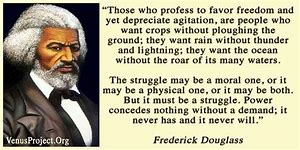 "It is natural to man to indulge in the illusions of hope. We are apt to shut our eyes against a painful truth — and listen to the song of that syren, till she transforms us into beasts. Is this the part of wise men, engaged in a great and arduous struggle for liberty? Are we disposed to be of the number of those, who having eyes, see not, and having ears, hear not, the things which so nearly concern their temporal salvation?" I’ve read myriad articles that state that the influx must be stopped; agreed. But even if the invasion flood were turned off; flat out, stone-cold stopped, but nothing else changed, it would not end well demographically. Western flatline population curves must be bent steeply upwards, and fast – so how to encourage this? Part of that will be to re-kindle Faith in our populations, certainly no easy task. But I will write on that separately, along with other things that are depressing population growth. I take no pleasure in observing this and, again, greatly wish it were otherwise… but we have been handed a situation where there are no clean, neat, simple options. Every sane person yearns for an “easy solution.” Does it exist? Please enlighten me, for I don’t see it. It would be great if the silk-robed SOBs could be voted out en masse and people who love their countries elected; there are signs this is coming, and good. Will it be enough? It would also be great if, after those elections, the flow can be stopped and then reversed. Will it be enough? I hope and pray YES; I fear NO. NITZAKHON -- This is an excellent blog post! 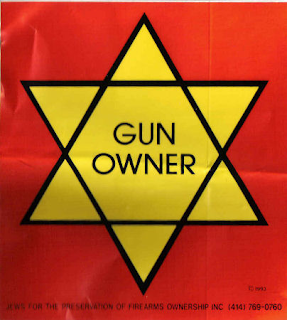 I found it via your link at Jihad Watch, which I frequently visit. I'm a tree-hugging vegetarian & religious skeptic who is totally awake to the threat that Islam poses to the West -- and horrified (and disgusted) by PC, Islam-friendly liberals and "progressives". I'm glad to find someone who promotes the same basic agenda I often do via comments on Jihad Watch, etc. 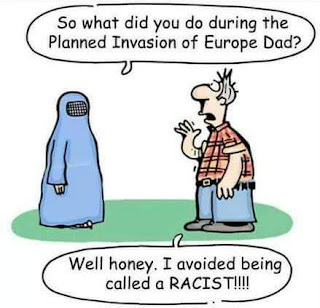 -- the idea that we must view the Demographic Jihad as a war on Western Civilization, and resist the invasion until not one single Muslim remains in the civilized world. I say deport them all; drive them all out; do whatever it takes to preserve the free societies of the West. I'm glad I found your site, and will recommend it to others. Thanks for all of the great info & sentiment contained in this article. Please keep up the excellent work!